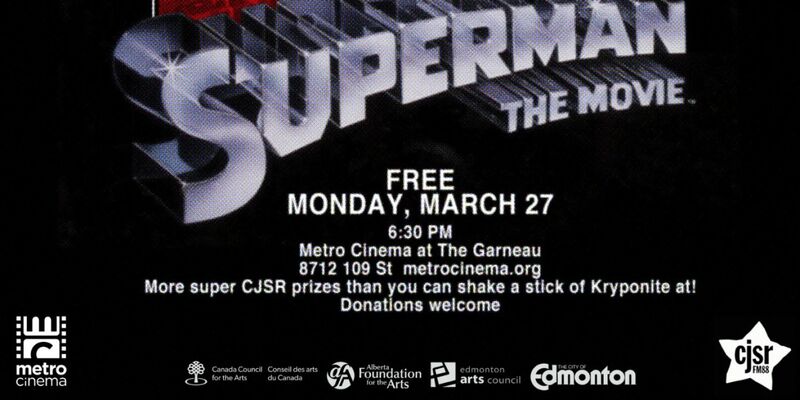 CJSR Presents a Free Community Appreciation Screening of Superman! March 6, 2017 | Joe Hartfeil & filed under Special Events. On March 27 at Metro Cinema​, we’re showing this classic in recognition of all the superheroes who volunteer with and donate to our station! CJSR presents this FREE community appreciation screening of an Alberta-filmed classic at 8712 109 St, including more prizes than you can shake a stick of Kryptonite at! Optional donations will support the operating costs of CJSR FM 88.5.